Hello everyone! Happy Wednesday! Where has this month gone? We’ve been going like crazy since the start of the year, but more about that later. I just want to share with you a quick, easy, HEALTHY recipe for a salad that I love to eat for lunch. I’ve actually had it the last two days! It’s basically a bunch of “leftover” food from another meal that I chopped up and put on top of my romaine lettuce. It’s very low in calorie. I believe this large bowl of salad is around 325 calories total. And it’s very filling! To start with, I had some leftover chicken breasts from dinner Monday night that I shredded for my salad. All I did was cook them whole in a skillet on the stove with a little olive oil and Pappy’s Choice Seasoning. If you have never tried Pappy’s I highly recommend you get a (large) bottle. I use it on everything-pork, chicken, veggies, etc. It’s so good! Anyway, before I put the leftover chicken breasts in the frig on Monday night, I shredded it knowing that I would be putting it on my salads this week. Also, left over were the fresh mushrooms. I bought a large box but only needed about half of them for dinner Monday night. I also had some celery sticks in the frig, those pepperoncini peppers, and the lite raspberry vinaigrette. The only things that I did buy at the grocery store were the pomegranates and the head of romaine lettuce. I used to buy the bagged, pre cut romaine lettuce, but it seemed to go bad on my quickly. Then I realized that buying an actual head of romaine is WAY cheaper and it stays fresh so much longer! 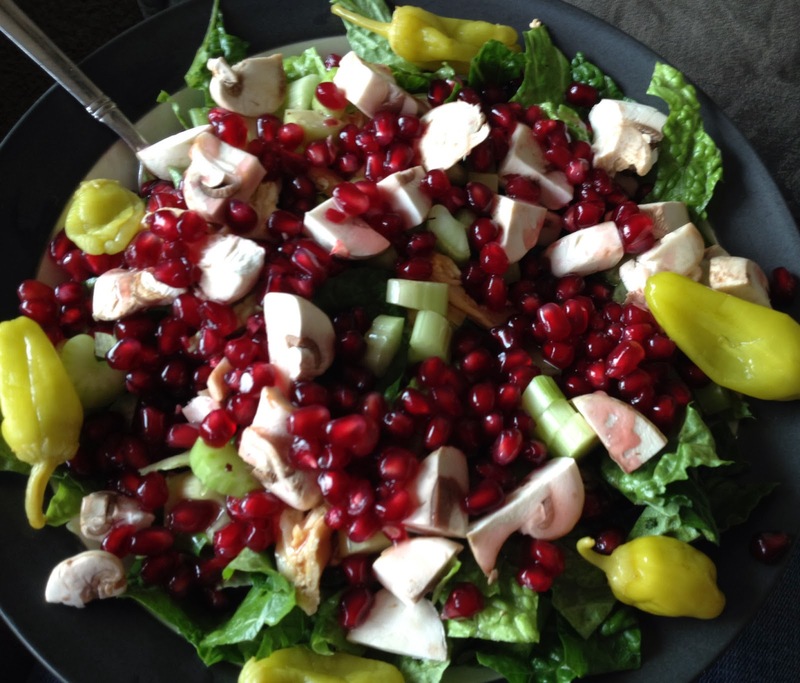 This salad is pretty easy to throw together after you peel the pomegranates. I used to hate doing this, but suffered through it just so I could eat the delicious seeds. It used to take me about 20 minutes to peel two of them. Then a good friend of mine showed me a little trick to make peeling pomegranates go so much faster! I recorded a video demonstrating how to do this! Cut it in half with a sharp knife. Place half of the pomegranate in your hand and make little slits (about 4-5) around the outside. Gently pull it apart a little to help loosen the seeds. Next turn the pomegranate over so it is face down in your hand. Take a wooden spoon and beat the backside of the pomegranate for about 30 seconds or so. You will need to rotate the pomegranate a little so you can hit on all sides of it. The seeds should just fall right out! Easy as that! After the pomegranate seeds are out, just throw everything in a bowl and enjoy! 2. Place all the ingredients in a bowl and toss. Enjoy! Wow! Loved your tip on the pomegranate! I may get one so I can try this! Thanks!